"Humans may be able to mutate into supermen in the near future," said Yoshiyuki Sankai, professor and engineer at Tsukuba University who led the HAL-5 robotic suit project. The fifteen kilogram battery-powered suit detects muscle movements through electrical signal flows on the skin surface. These currents are picked up by the sensors and sent to the computer, which translates the nerve signals into signals of its own for controlling electric motors at the hips and knees of the exoskeleton, effectively amplifying muscle strength. 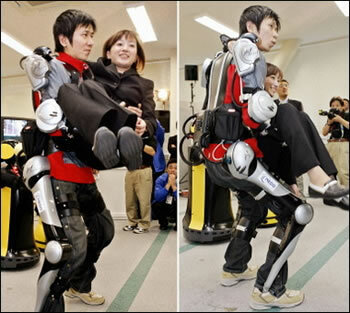 HAL stands for "hybrid assistive limb"; HAL-5 is the latest version of the suit. Here's how it works, minus the diagrams. The inside of the suit is a mass of pressure receptors, hundreds of them. You push with the heel of your hand; the suit feels it, amplifies it, pushes with you to take the pressure off the receptors that gave the order to push. As Heinlein put it - "The real genius in the design is that you don't have to control the suit; you just wear it, like your clothes, like skin." See more at Robot Suit. You might also be interested in this description of a military exoskeleton from A Good Old-Fashioned Future by Bruce Sterling. Thanks to John and icecycle who wrote in to contribute this story.